If you were to ask the average 2017 Volkswagen Touareg buyer what they thought was missing from this luxurious crossover, most would say the same thing; nothing – but what would be nice is some form of luxury badge to show the Touareg is loaded with features and offers a level of luxury few associate with this legendary German automaker. If you were to put the 2016 and 2017 VW Touareg next to each other you might have a hard time seeing any changes between the two. Beyond a few upgrades, the only real changes made include adding the optional Technology package to the base trim as standard and changing the name of the Lux trim level to the Wolfsburg Edition. 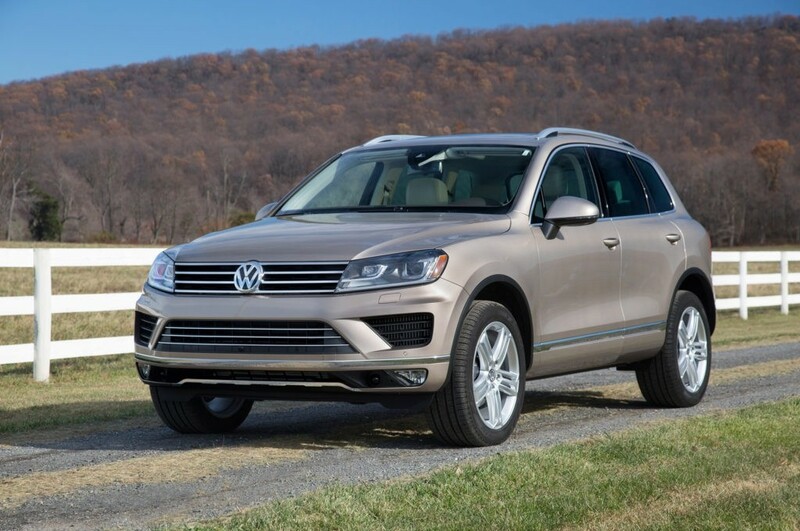 This year the Touareg is available in three trim levels: Base Sport/Technology, Wolfsburg Edition, and Executive. All versions of the 2017 Volkswagen Touareg come equipped with a 280 horsepower 3.6-liter V6 engine that pumps out 265 pound-feet of torque. They also come standard with an eight-speed automatic transmission and all-wheel drive for those slippery winter driving conditions. The Touareg gets an EPA-estimated 19 combined miles per gallon. This breaks down into 17 mpg city and 23 mpg highway, which is slightly above average for this class of crossover SUV. Under normal testing, the Touareg will go from zero to 60 mph in 7.7 seconds. One area in which the Touareg shines is in its towing capacity. When properly equipped, this vehicle can haul a massive 7,716 pounds, which is exceptionally high for this class of vehicle. When you open the door of the VW Touareg, the first thing that hits you in the face is the high-quality materials used throughout. From the wood and chrome, trim to the large touchscreen used for the infotainment system, the interior has a lot to offer. While this crossover seats only 5 people, there is plenty of legroom for everyone, even in the back seats. One thing buyers love is that the rear seats sit high enough to provide plenty of thigh support for taller passengers. If you are like most buyers and looking for a vehicle with plenty of cargo space, then look no more. The Touareg offers 32.1 cubic feet of storage space with the rear seats in the upright position. If you need more space, simply fold the rear seats down and enjoy a massive 64 cubic feet of cargo carrying space. If you are interested in finding out if the 2017 Volkswagen Touareg crossover SUV is right for you and your family, the best way to do so is drop by Durham Volkswagen and take one out for a test drive. Call us today at (919) 493-7411 and schedule your test drive today! We have one of the largest selections of this luxury mid-size luxury crossover in the region ready for you at the best possible prices.